If I wasn’t sure whether this Caprice was CC-worthy at first, my opinion changed the stickers in the rear window; the owner of the car was apparently an engineering student at the University of Dayton engineering. When you consider most younger people wouldn’t choose to drive a car like this without a more fundamental understanding of its now-uncommon mechanicals, it actually makes sense. This is most definitely a “car guy’s” choice. There are generally two ways to appreciate a sedan like this; one, because you enjoy the big impression it makes or two, because you can appreciate the fundamental differences between its full-frame, rear drive V8 layout and most other cars on the road. Given its generous specification, with leather trim, the original buyer might have given the former consideration more bearing on his or her purchase, but when noting the dual exhausts, perhaps he or she might’ve been aiming for a sleeper Impala SS. The current owner no doubt knows the car’s now-famous capabilities, though in basic Caprice Classic trim, I’m sure many casual onlookers do not. The new-for-1991 Caprice was never appreciated for its style, but the minor tweaks which define this facelifted 1995 help its looks greatly. By deleting the rear wheel skirts–a styling flourish I ordinarily like–and adding a notch to the rear quarter light, the impression of visual mass was reduced, making the car less ungainly overall. It wasn’t too big of a boon to sales, of course, as civilian versions of the car in Caprice trim weren’t the biggest sellers by this point, but that just makes this siting more special. Styling tweaks notwithstanding, these final Caprices were far from beautiful, but their appearance was at least appropriate to their mission as a soft, capacious conveyance. With the new-for-1994 LT1 engine, there was finally power to back up the expressive styling, even if its appearance in the car was almost accidental. The previous 5.7 couldn’t meet upcoming emissions regulations, so reaching into the Corvette parts bin allowed engineers to keep a bigger engine on hand without having to spend much money. Despite the substitution of cheaper, heavier and more restrictive iron heads, it was a real win-win, with 260 horsepower (forty less than the contemporary Corvette) and 33o lb-ft of torque on tap. With big tires, a limited-slip differential and a lower final drive, the Impala SS made it to sixty in 6.5 seconds; the Buick Roadmaster, with smaller rolling stock and a taller rear end, took 7.8 seconds. The Impala topped out at 142 miles per hour, while the Roadmaster’s limiter ended the fun at 108; at least the super tall gearing allowed the engine to loaf along at 2400 rpm at that speed. 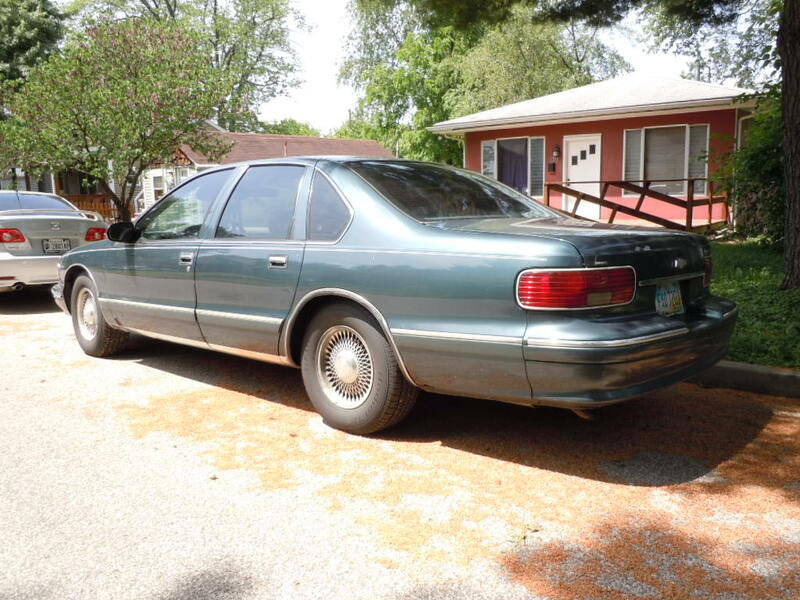 This Caprice is probably closer to the Impala in terms of performance, since the Chevy’s optional engine (standard in the Buick) also came with the Impala’s lower final drive. In any case, do not assume all 1994-1996 Caprices come with the LT1 standard; many came with the standard 4.3 liter L99 V8, which met emissions standards all the way to the bitter end in 1996, when OBDII was launched (so also remember that swapping an earlier engine into a ’96 takes a little extra effort). The seating surfaces and armrests show this has been a well-preserved car. Let’s hope it stays that way; as cars that mark the end of an era, there need to be a few which stay in clean, original condition (outside of Florida). When looking at this car, I am reminded of my best friend’s grandfather who was an aerospace engineer at GE. He drove cars like this until they went out of production, after which point, he moved on to a G-body Bonneville (his last car), and I like to think he recognized solid mechanicals when he saw them. The fact that he wasn’t convinced by the Lumina further backs that up; by the time 1997 rolled around, GM was really phoning it in with that car. Replacing the Caprice and Impala SS with a front-drive chassis really required a supercharged 3800 in an H, C or G body, not a reskinned original W-platform. That, of course, is a nearly twenty year old story and 1996 was a very different time. I suspect more than a few Chevy buyers were very content with their Tahoes and Suburbans, and that those trucks brought in a younger, spendier audience than did the the Caprice. Better in GM’s mind, I’m sure, not to put too much effort into any direct successor, especially when the indirect replacement was already far from competitive. Ford would draw the remaining traditional all-American sedan customers over to the Crown Vic and Grand Marquis over the next fifteen years, but those twins never had the cachet of the big GMs, sacrificing oomph and isolation for a marginally more modern driving experience, slightly more cohesive style and better fit and finish. As an engineer-acquaintance of mine owns one of those cars, I suspect their no-nonsense appeal is much the same as this Chevy’s, though for me, a Park Ave would make a better replacement. As always, opinions on these “beached whales” are generally hotly contested, with some regarding them as Deadly Sin contenders, but to quote Tom Klockau, I feel they were the last of the best. Probably one of the best-preserved daily driver examples I’ve seen in many years. I like the color (which is close to if not the same color offered on the Impala SS) and the rarely seen leather seats. Still doesn’t change my opinion of this car though. For as long as I can remember, I’ve thought that this was one of the ugliest cars ever produced. Time doesn’t do it any justice either. It still looks as hideous as it did 20 years ago. I’d much rather take a 1990 Caprice or any Panther. I totally & completely agree with Brendan Saur. Panthers RULE!! GM at its worst. These Roachmobiles are simply awful in every sense of the word. Other than the drivetrain, I don’t see who this car would appeal to. Obviously it did have a few friends, nevertheless. Comparing it to a Ford CV or Merc GM, I’d take the Ford product if by that time the C pillar glass was deleted. Otherwise, Ford’s offering was just as ugly. I have one with 151000 MILES , and… do not want other cars !! Looking for a second one , GREAT CARS ALL ARROUND !!! Great article! It’s a shame GM (and Ford as well for that matter) didn’t replace these whales with something decent. I suppose many see the SUV’s as replacements but I don’t agree. There is nothing like a grand rwd sedan with a large engine and now when the Town Car is not produced any longer there is really nothing left in this segment – from the US at least… Re the car on the pics I can’t stop looking at those ugly wheels. How could the original owner select them from the options list in the first place and what’s stopping the present owner to change them? How about at least fitting them with whitewall tires, that would help a bit. Well, the car seems to be in decent condition for its age so I guess the owner cares and that’s good. This car is definitely a keeper! There is, its the Chevrolet SS, it has been available starting this year. I’m pretty sure that this Chevrolet model was officially imported 20 years ago. I still see them now and then, especially as a taxi, a hearse or as a car in a funeral procession. Having been raised on the B-body beasts from the 1977 edition until the square ones went out of production in the early 1990s, let me make a statement. If you simply want the isolating driving experience, loafing along, there are replacements in feel for these cars that are not RWD/BOF. Having been car shopping recently I would argue that the non-performance versions of many popular sedans and CUVs offer a similarly relaxed and isolating ride. I guess that this would not include the Chevrolet SS sedan with 6.2L V8 imported from down under. 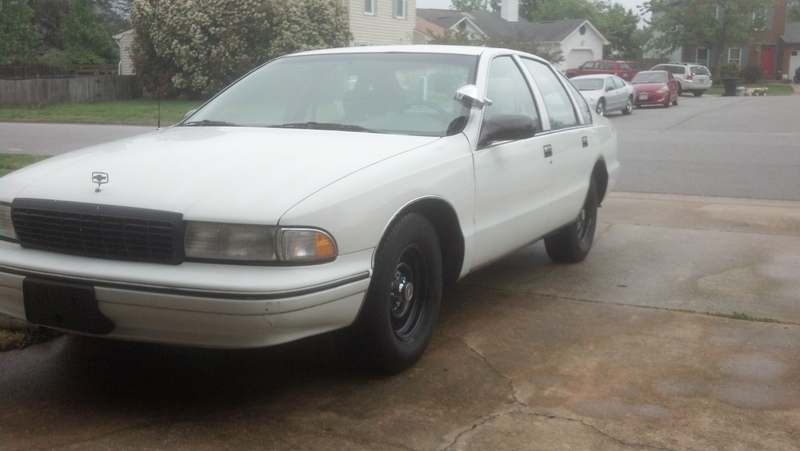 I have owned this ’94 caprice wagon for 14 years. This is an all orig. car. It’s still in mint cond. to this day. These cars are a dream to drive. It’s like driving down the highway in a Lazyboy. I don’t think it can be replaced with anything of quality or condition for the value. These were the last of the full framed rear wheel drive cars for GM as of 1996. Trucks of course still dose. Big mistake. Police shifted gears and dumped GM and moved more to all their purchase’s to Dodge and Ford products. Sorry GM, your lose. Anyway I Love my wagon and wouldn’t part with her. Well, first of all, in 1996, there wasn’t even a Mopar police car, they hadn’t make a “proper” (in your opinion) police car since 1989. All they were offering in 1996 was maybe a police package for the Intrepid. I don’t understand the “love” that non-fleet people seem to have for seeing their preferred make in police and taxi service? As if it was “rah, rah, rah….there goes a Chevrolet police car! ” hooooooooooooooray? Police, taxi and other fleet sales are low profit give away sales that for the most part, make little to no money for the manufacturer. Most companies push fleet sales heavily to keep the assembly lines moving when they can give away their retail units, see Chrysler police cars in the 1970’s. There was a time when police cars were low profit and certainly some companies have and still try to give them away (Chrysler) but Ford did a good profit on the Crown Vic, and still do on the utility and sedan interceptors. GM definitely thinks there is profit to be made or they wouldn’t import the PPV which originally was only going to be for police duty though they did relent and of course are now selling the SS. Fleet sales are what kept the B-bodies going as long as they did. GM chairman Bob Stempel was supposedly quoted as saying that GM was a “front drive corporation” and the ’91 B-bodies, especially the Buick, Olds and Cadillac variants had been built “over my dead body”. More than a few LE agencies stocked up on ’96 9C1s the same way they did for the 2011 Crown Vic. The interesting thing about the Caprice PPV is that it doesn’t have to support a retail car, no advertising, no brochures, just a fleet only special, it is interesting, though I wonder how much profit there is there after all the importation from Australia is done. I imagine that certifying the SS for sale, even though it is based on the SWB Zeta was free icing on the cake after certifying the PPV. To me police car/fleet sales should be the extra gravy you make on a regular sedan, not the entire reason to keep a line up of cars in existence. I think cars like the PPV/SS are a more modern and reasonable “full size RWD” car, my wish would have been to move to something like this starting in 1996, after the B’s were dropped. GM did seriously consider bringing over the previous generation VZ Commodore, as a Buick for a while, Holden had been “courting” GMNA during the time, showing them several LHD Commodore concepts. They only one that made it through was the GTO. Though I would add that profits they made on the Panthers, were at the cost of the total removal of content from all of the Panthers, the loss of different rooflines between the Crown Vic and the GM, the cheapening out of the dashboards, even in the Lincoln Town Car, and even that, by the end, the lack of any interest from retail customers is what did them in. I love big BOF cars, don’t get me wrong, but they still needed, at least in my opinion, a viable retail product that gets regular customers interested in the product. There is blame all around, GM did drop the BOF cars right when they were getting to be pretty good, especially with the LT engines, but Ford sort of kept them around as decontented zombies for another decade and change, even stuff like the Maurauder, which was pretty cool, didn’t do much to spur interest in big cars. Even the odd, but not totally unattractive redesign of the Town Car didn’t help that much. I’ve often wondered, besides some of inherent and obvious benefits, real or imagined, of the “traditional police car” (i.e.-big V8 sedan)is it really needed for most departments? Especially city municipalities? Where the car will spend most of it’s time driving around at 30mph or parked. I’m not saying Smart cars or something dumb like that, but I imagine most city police service could be accomplished with something like a Malibu or a Fusion with some heavy duty cooling and seats. Holden would be making the profits on the PPVs. GM owns Holden of course, so GM still makes money. The PPVs are based on a standard Holden sedan so they are not a specialty model. BOF made sense after WW2 since that was the design. By the sixties cars were big so that unibody designs probably were not optimum. However, with the down sizing after the mid seventies, BOF seems increasingly outdated to me. If cars like the 71-76 Fleetwood’s were still in production, perhaps BOF would make sense, but cars of that size are in very limited demand. Furthermore a unibody design might actually be far better. What I would have liked to see was maybe a unibody downsized big car for 1985, instead of, for example, the C/H body FWD cars, perhaps an inbetween, before they went all the way down to that style of car, if they would have considered(and maybe they did and they axed it) a unibody RWD DeVille/Electra/98 type car, even more interesting is if they would have changed only the B-cars to FWD H-cars and left the C-cars RWD. Could have been interesting, you could have seen the Fleetwood become more of an S-class type car for example. GM did not have hindsight at the end of the 70’s. They were really ahead of/or on top of/ the oil production situation. They determined that FWD was the way to go. My 86 Electra weighed about 3300 lbs, far less than my 78 Olds. I am sure GM could see that they had bungled things by the late eighties. GM really gets serious with making quality cars in the mid 90s with the Aurora body design. I think that they should have gone with RWD on the Aurora design. This would have made a huge difference in perception of GM’s big sedans in the mid to late 90’s and early this century cars. @Fred, the PPV is a specialty model. You can’t just import an Austriallian vehicle to the US you have to design and use lighting that meets DOT requirements, Use fabrics and plastics in the interior that meet flame spread and smoke standards. Design and use airbags and seat belts that meet US standards. Certify the power train.to meet US emissions standards and that is before you equip it with police specialty components like different brake pads, spring/shock rates, improve the cooling system install higher output alternator that charges at a high rate at idle, add auxiliary power distribution, provide wiring to add the emergency lights and communications equipment, ect. As far as Holden making money on them I would suspect they make a dollar or so on each one. GM likely transfer prices it so the “profit” is made in the US. If for no other reason than to justify their plans of shutting down production down under. Though it is also likely done that way to show profits from the Chevrolet division. @Carmine, for the fleet models on the one hand they really didn’t cheapen them out in many ways they already had traditionally skimped on them. However on the other hand they did put more into the rentals in other ways, leather became standard as did aluminum wheels. They also continued to put high quality tires on them using Michelins on the Town Cars for example. They were also full tread depth tires unlike the tires that come with 8/32″ of tread on Chrysler and Toyota retail vehicles. They did cheapen the retail versions though like loosing the rear sway bar for one thing. However the fact of the matter is that the reason that Ford stayed the execution of the Panther at least 3 times was because of all the crying that fleet purchasers did. If they weren’t making money on them why would they keep relenting and end up making them for 4 model years after they had originally intended to stop production. I understand that they need to meet USA standards, however there have been other cars (GTO, G8) imported from downunder, so they may already meet most of our standards or have provided an easy way to upgrade. The point I was making is that the PPVs are based on a production Holden sedan and while the PPVs need some mods, they still add to the production output of Holden’s factory and so reduce the fixed costs of building those sedans or to be precise, the fixed costs of running the factory can be distributed over more cars. GM would have to have some reasonable expectations to sell enough of them to put them into production to begin with. I don’t see Holden selling them below cost. Assuming that a significant number are built, Holden’s costs per car will decrease somewhat making their profits larger on their domestic sedans. I am also sure that GM would not sell these below cost to police departments either. I see money made at both ends of the supply line. Now the SS is available to everyone, but I would like it better with the 3.6 V6. @CARMINE – Totally agree on the PPV/SS, and I wish GM would have started developing something similar back in the 80s. I actually like the whale B-body, but they were relics even when new. A truly modern replacement more along the lines of the cars Holden was building likely would’ve been a hit back then and still would be now. The success of the Chrysler 300 and Dodge Charger should have triggered a RWD renaissance in Detroit. I think the run-up of the AUD put paid to Holden making any money on the PPV, I’m sure I read the contracts were signed based on a much lower exchange rate. They were seriously looking at taking Holden to the US with the 1997 VT Holden, and again with the current generation car in a much bigger way than just the G8. Ahhhh the police Intrepid. Cops around here had them for all of about 9 months, they shredded transmissions like nothing they had ever seen before, so they dumped them all for next to nothing at auction. It was pretty telling when they went to auction, too, as usually even the clapped out 4.3 Caprices that the city cops had would go for decent money – they basically had to give away the Intrepids. I remember when the Impala SS came out, with its little panel over the corner of the rear quarter light — Aha! That is what this car should look like! So I was glad to see Chevy make it real across the Caprice line in a later model year. But I’m not as enamored of the no-longer-skirted rear wheels. To be sure, the skirts were funky and not very mainstream. But the new rear wheel well never looked quite right — kind of like a slightly droopy eyelid. GM took the easy way out when opening up the rear wheel on these. The proportions are a little off since they used the same rear door off the skirted model. To have made it look right they would have had to redesign the rear wheel well and door. As it is they just cut out the opening following the original stamping and called it a day. Exactly. And the wheel sits too far forward in that awkward opening. It never looked properly centered either, the Impala SS wider wheel seemed to remedy this a bit, but it looked odder in the narrow wheel versions. It’s one of those things you don’t notice at first but once you do it just pops out at you. Aftermarket extended rear control arms are available to center the wheels, but many cars also need an extended drive shaft. That, my friend, is the sad result of the 1977 down-sizing of the B-bodies. They took the length out of the rear seat area. Compare these to the pre-1977 models and see the difference. Our 1990 Plymouth Acclaim had more max. rear seat leg room than these, believe-it-or-not! Unfortunately, after shortening the B body frame, they left all the rear overhang in – something they should have addressed as well. I love this generation Caprice Classic. I was disappointed, at best, when Chevrolet discontinued it, and the Impala, in favour of smaller, front-wheel drive Impala. 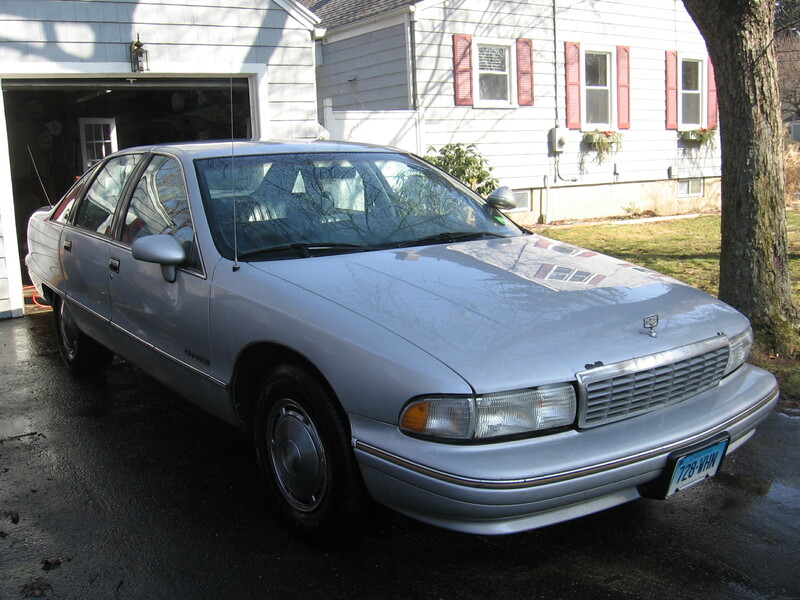 Remember there was a gap between 96 and 2000 that the largest Chevy Sedan was the Lumina. 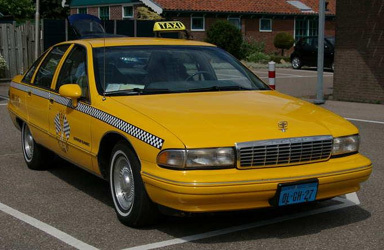 The W body Impala did not debut until 2000. Was there? I didn’t notice that. I may be old-school, but I prefer the bigger, rear-wheel drive Caprice and Caprice Classic and Impala over the newer cars. I thank you for the article. I was not a fan of the headlight design of this car. The sad part is many cars have this headlight design now. I think it should have two headlights on each side of the grille. This one headlight on each side of the grille makes it look like a cheap low end car and it is not aesthetically appealing. The skirts leaving was an improvement in the case of this car even though I think they look great on “certain” other cars. The seats and interior were fine. The seats look nice. I know the digital speedometer was standard by this point but the other gauges were analog. GM dropped this car like nothing. I think there should have been replacements, but there were not. The market became truck and suv heavy. Ford owned this market with its trio for a while. As one reader said, there are no sedans like this anymore. I would not call the Charger and 300 full sized and the others are midsized. The other issue I have is the c-pillar and that window. Too many cars have that now and it looks like an after thought. That third side window should be connected to the rear doors. My neighbor around the corner has a burgundy version of the same car in this article. He takes great care of his car too. I assume he prefers to older models like I do. It is a daily driver like mine are. It is funny how they tried to put the Lumina in its spot for a few years then replace it with Impala 2000. To me it seems the new Impala is a modern interpretation of this design theme. This car served its purpose when it was in production. There is still a market for cars if they are done correctly. Thanks for the videos. Funny thing is that Florida Highway Patrol car would only be legal in 49 states if it were over here. I tend to agree. 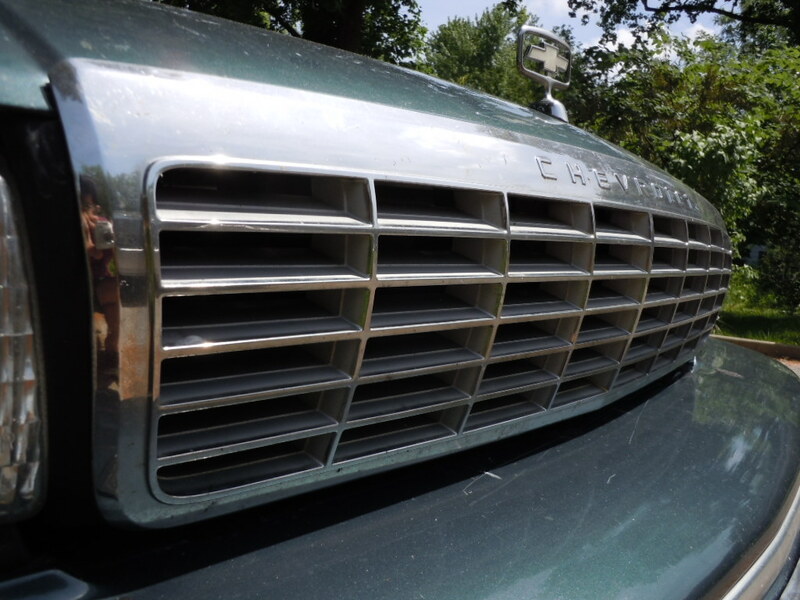 I remember when cars had two headlights on each side of the grille. Why they ever switched to just one on each side is beyond me. WHOA!! It is a Cash for Clunkers survivor; sweet peas!! By the way, as of 2011 or 2012 Idaho Springs, CO still had a 94 Caprice 9C1 in active duty including I-70 patrol because (paraphrased) they love it. That Caprice out lasted all the Dodge Intrepids and I think 00-05 Impalas. Not only a C4C survivor, but one that has survived undonked and/or turned into an Impala SS clone. The B-bodies were very much a niche car by the time they were discontinued, but they were still a modestly profitable niche for GM. What finally killed the Bs was the fact the ancient Janesville, WI plant was already having trouble building enough Suburbans when the Tahoe/Yukon became an instant hit. Arlington, TX had been cranking out the Bs ever since the Clark St. Cadillac plant in Detroit closed in 1987 and was significantly underutilized. It only made sense to add a second source, and Arlington has been building big SUVs (which like the Bs have become a niche product built only in Arlington) ever since. Back when I worked as a mechanic at Champion Chevrolet, I remember Chevy offering a model of Caprice called the LTZ, which seemed to offer the best of both worlds- the engine and underpinnings from the 9C1 / Impala SS, along with the plush innards of the Caprice Classic. Does anyone else remember those? Could this car be one of them? I was thinking the same thing, the LTZ was rare throughout the “fudgy the whale” Caprice run, I remember them pushing it pretty big in 1991, it was the one that won MT’s Car of the Year award too. The original LTZ was sort of a proto-Impala SS, it had the (as Elwood would say…cop shocks, cop brakes…. )F41/police car suspension, it had the cop car gauge cluster too, which had a tach and full gauges with a digital speedometer in the original non-dual airbag dash. 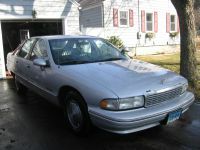 As people want to mourn these, and they were great cars, I sold this vintage of Caprice new, or rather, I didn’t sell them, and that was their problem, we had a whole row of these sitting around in 1996, I barely ever showed them to anyone, I had one test drive, an old lady who was interested in trading in her, you guessed it, 1982 Caprice for a new one, we had some interest in the Impala SS, but not even that much really, meanwhile, we were pumping out Blazers, Tahoes and Suburbans by the truck load. The LTZ was available 91-93. They dropped it for 94 when the Impala SS came out. 1993 is the year to get on those as it’s the only year you could get the 5.7 L05 engine (instead of the regular Caprice 5.0) and has the new for 93 skirtless rear fenders. IIRC, it had the police package’s suspension and brakes as well as its external oil and transmission coolers and extra capacity cooling. Also, in 1993, it was the only way to get the 5.7 in the civilian sedan. The dash was actually better than any later LT1 model, because it had digital Speedo (regular models had analog), analog tachometer (not available after 93), plus volt, water temp and oil pressure. 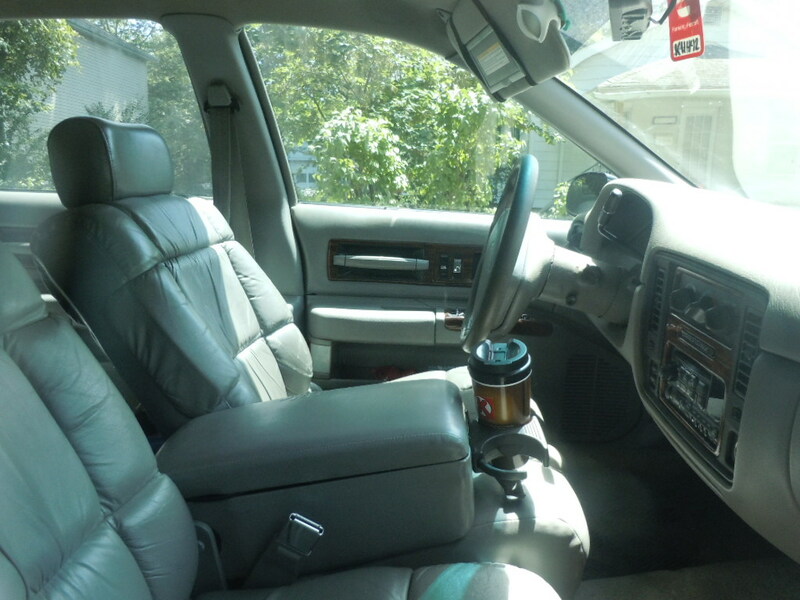 My buddy of 24 years had a red 1993 LTZ several years ago with matching red leather interior with power everything. It was a very rare piece. The TBI 180 HP 350 got the car off the line well enough but quickly ran out of steam at only 4200 RPM’s in first gear making highway passing seem sluggish. That car sure rode and handled well however despite the lack of grunt under hood but 25 MPG on the open road was a pipe dream. 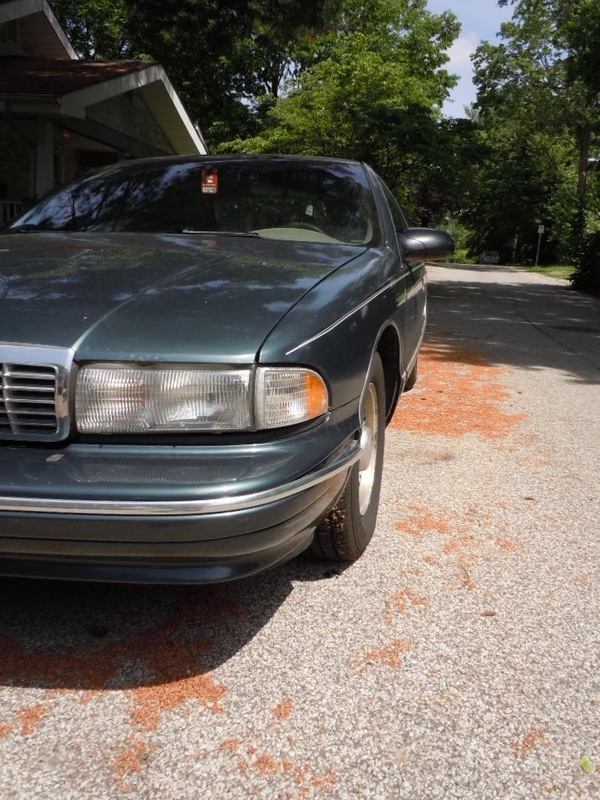 My 1996 4.3 L99 Caprice actually seems quicker on the highway mainly due to it’s far better breathing heads and higher RPM redline and any 1994-96 LT1 will slaughter the LTZ in a race. Looking at several TBI 350 videos on youtube supports what we found on his LTZ. These engines are all done in at a mere 4200 RPM’s which makes me wonder if these motors had there wings clipped for better EPA ratings on paper. The LTZ wasn’t quite the 9C1, and neither was the Impala SS. The LTZ had many of the upgrades from the 9C1, including quicker steering, bigger tires, stiffer suspension and bigger rear drums. The LTZ used 3.23 rear gears, the 9C1 was 3.42. The 91 LTZ was 305 only, 92-93 had the L05 350 but it was rated considerably less than the Police version. The suspension on the LTZ was FE3 if I remember correctly, but not exactly the same as the 9C1. The LTZ also had no hood ornament, just a flat emblem. They were rare when new, most people wanted a “soft” Caprice. I’d buy a LTZ in a heartbeat. Chevy is marketing an Australian RWD, unibody, sedan with V8. Front engine rear drive is still in the showrooms from Ford GM and Fiatsler BOF died out in the early 50s except for a few US throwbacks and commercials, cars of this configuration are getting hard to sell with $10 per gallon gas but even the fuel mileage is good now for those that do buy. I’ve owned a 94 and 95 9C1 (police package) Caprices, a 94 wagon and currently a 96 Roadmaster wagon. It’s fair to say I’m a LT1 b-body fan! Good article, I would just clarify that the Caprice and Impala SS had the same final drive ratio (3.14). Also, the 5.7 engine did not require the tow package. It did require the F41 upgraded suspension. The Impala SS came with even firmer suspension (basically the police package setup), plus the wider wheels. 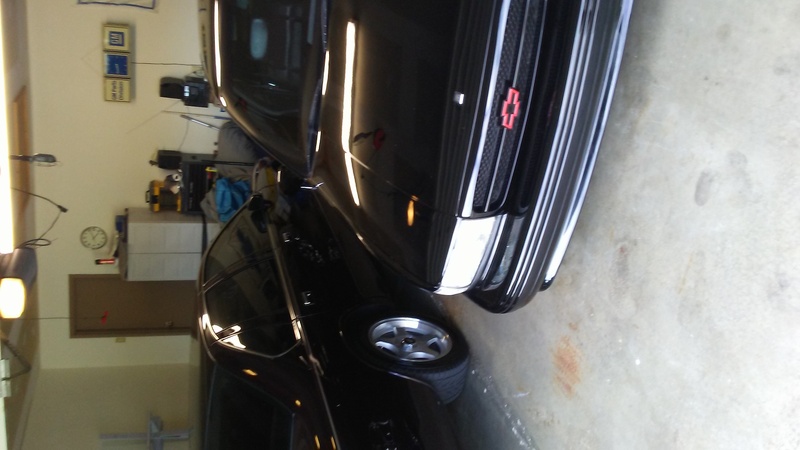 There was no drivetrain difference between the LT1 Caprice and the Impala SS. It was actually a 3.08:1 rear end ratio for the Impala SS and Caprice LT1. I don’t think the 8.5″ GM rearend ever came with a 3.14:1 rear end ratio. 1989-93 LO5 PC1 Caprices used 3.42 rear gears, but the LT1 was reduced to 3.08 and it still was a lot quicker. I remember people complaining the Impala SS only came with 3.08 gears when it came out. 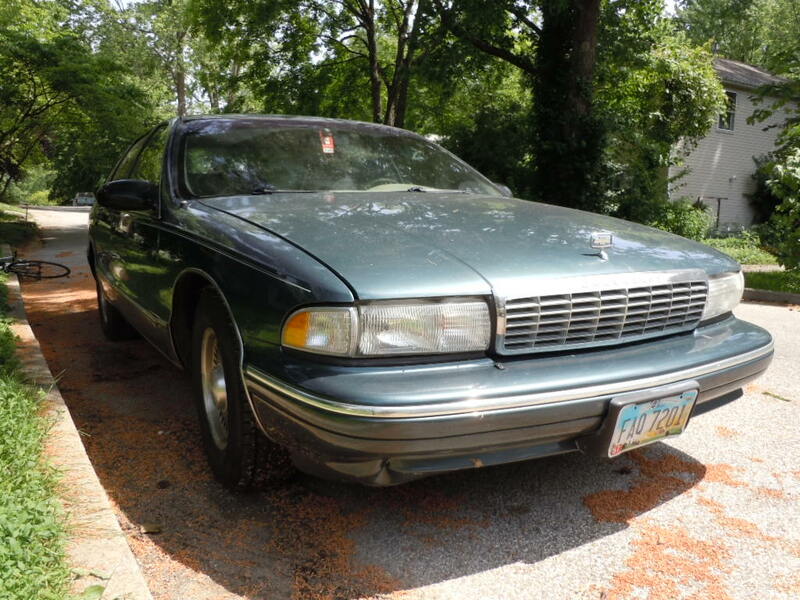 I would also argue that a LT1 Caprice would have pretty close to the same acceleration times to an Impala SS, and it would be quicker than a Roadmaster. I’m too lazy to look it up but I think the Caprice came with at most a 2.93 rear end, even with the LT1. The 3.08 was limited to SS and 9C1 cars. The tow package got 3.42’s and a mechanical cooling fan that lowered rated horsepower to 250. I have never heard of a Caprice with the tow package though, I think it may have been a Roadmaster and Fleetwood thing. Also the dual exhaust indicates the 5.7L LT1. The 4.3 L99 came with single exhaust and was only available on the Caprice (Buicks and Cadillacs got the LT1 standard). 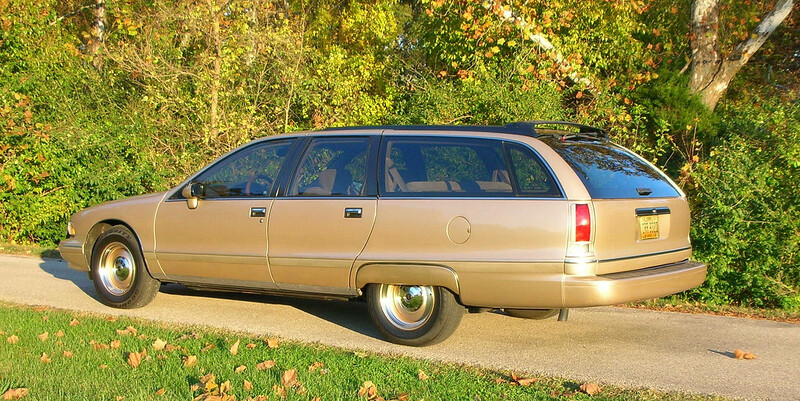 Finally, keep your eyes peeled for the truly rare 90’s B-Body: the Oldsmobile Custom Cruiser wagon. Only built for 1991-92, only 12,000 were sold. It’s just a Caprice Wagon with a different grille, but it was the last RWD Oldsmobile. Wagons with the tow package had 2.93 gears, 2.56 were standard with the LT1. The 3.42 gears were not optional on the 94-96 Caprice. A 3.42 gear set was available for Fleetwoods that allowed 7000 lb towing; these were not avialable in Chev or Buick. Thanks, I was thinking 3.14 sounded wrong, it’s been a while since I thought about that. 1994-96 wagons all came with the LT1 and had a std 2.56 rear gear. So did the base Roadmaster and Fleetwood. All Caprice Classic sedans that were ordered with the 5.7 LT1 came with the 5000 LB tow package and 2.93 rear gears. 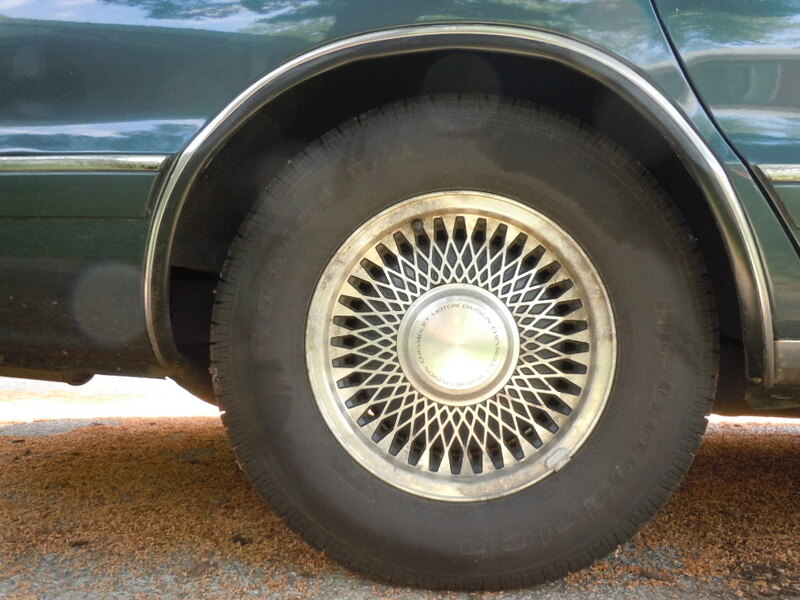 Only the Impala SS and cop cars came with 3.08 and 8.5″ rear end. The RM and Fleetwood could be equipped with 2.93 rear gears and you could also order the Caddy with a 3.42 ratio for 7000 LB towing capacity. I’ve always liked these cars. Six years ago I bought a one-owner 1991 Caprice wagon with a 305 and 107,000 miles. Paid $1000 for it, enjoyed it for 4 years and 56,000 miles and sold it for more than I paid for it. And even better, it simply…didn’t…break. 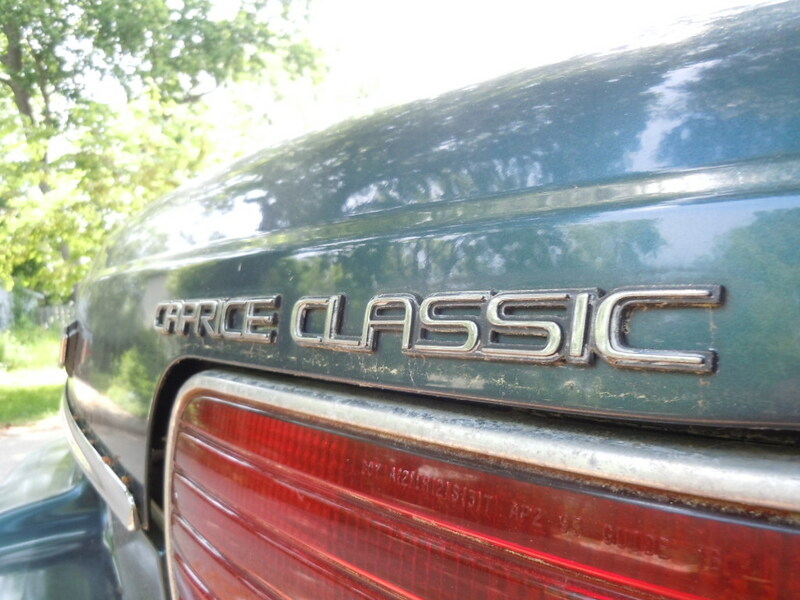 Sure, some stuff needed to be replaced due to age or as a maintenance item but few cars have been more reliable and durable than that Caprice. When the core market for a car becomes the government and the elderly the model is doomed. The Caprice was the last of GM’s “Living Room on Wheels” models. I’m a Lincoln fan and am looking forward to the new product that’s coming out over the next several years, but I don’t hold hope we’ll see a Town Car replacement. Equis as town car, you mean? I hadn’t thought of it, but you make a good point. Pretty sad when Hyundai is doing a better job with luxury than The Lincoln Motor Company. I wouldn’t mind having one of these (especially the wagon version) for my freeway commuting, although around here they are getting “donked” right and left. I do see a nice maroon one every once in a while with an older gentleman at the wheel, although that may come to an end in the next few years. I agree re: Hyundai–not sure if the US English-language ads have started yet, but Korean TV here in LA has been running ads for the new Genesis–it looks really nice! I drove a 91 Caprice 9C1 as an engineering student at RPI a few years ago, I wasn’t the only one, somebody else had a 94 9C1. It wasn’t a great college car, but I loved it’s purpose and presence, it was a muscle car in my mind. For most of my classmates, it was a weird dinosaur. But everyone was quick to pack in for a ride, it fit six and would still squeal the tires and kick sideways around a corner. I just sold my last Caprice on Ebay to a Caprice hoarder/junkie last week.. A 95 LT1 police package, one of 4 Caprices I have had(an Autobiography in itself). My year younger brother had a 95 9C1 with the 4.3 engine and it was a decent car. It pulled up to highway speed just fine, but the LT1 just has that extra grunt these cars needed. Weird dinosaur is a good description. These things are like old houses that have been upgraded and re-wired over the years. 95 is a tough year, it’s OBD1 and cheap code readers are useless. The ALDL key and the service manual is your friend when working on these things if you don’t have a Tech2. And there is the Opti-Spark…Completely replacing all the front engine seals and the water pump is the only safe bet to guard against their early and expensive death. They are deceptively difficult to work on, especially replacing the spark plug wires. If it was a police car, the wires are usually toast(literally) since they run under the manifolds. Lots of patience and Band-Aids needed. For a car that is often associated with a whale and considered ugly my 1996 dark cherry red Caprice is often given compliments at both car shows and at gas stations etc. It is such a different car compared to today’s smaller harder black interior cookie cutter sedans. You can actually fit 6 people in these with ease and the trunk is huge with a large opening. With new HD gas shocks it rides like a dream but handles well enough and the 4.3 200 horse 4.3 keeps up well enough with traffic and is surprisingly good on fuel on the open road and certainly far better than any truck or SUV I have driven, even V6 variants. It makes for a really enjoyable Summer cruiser and keeps miles off the 2013 Impala. I’ve always liked this generation Chevy Caprice. Both the sedan and the wagon still look as contemporary as when they were introduced 20 yrs ago. I still have two Caprice’s left . My 94 has 250,000 miles and pull a 28 foot RV all over US and Canada. The car has original paint with a few SS additions.